Jane could see Charles’s hands shaking as he tried to unlock the door to William’s suite. He finally aligned the key card correctly, and the lock clicked open. The suite was sumptuously decorated in rich shades of gold and blue. As Jane glanced around the living room, she wondered with painful irony how closely it resembled the suite that she and Charles had reserved for their wedding night, but that she would probably never see. She raised her eyes to meet Charles’s imploring gaze and took a deep, measured breath, praying for the courage to do what she knew she had to do. “Then you’ll sign it?” he asked, a glimmer of hope in his eyes. He pressed his lips together tightly, his face flushed. “I’m not under his control,” he muttered. He crossed the room and stood looking out a window, his back to her. Charles answered the door, and Caroline bustled into the room, blithely ignoring the tense atmosphere as she handed several sheets of paper to Jane. “Here’s the pre-nup. Be sure you read it carefully. There are some conditions that you’ll probably need to think very hard about. I had no idea Daddy had asked the lawyers to write it that way.” Caroline stood between Jane and Charles, looking back and forth expectantly, as though she were a spectator at Wimbledon wondering who had the tennis ball. An awkward silence fell over the trio. “Thank you for bringing this, and I appreciate the warning. But could you excuse us now? We’re in the middle of an important conversation.” Jane spoke politely but firmly. “Come on, sweetheart, sign the pre-nup, and I’ll see if the Bridal Suite is available tonight. How about a nice warm bath for two, some champagne and strawberries … and I’ll devote myself to making everything up to you. Doesn’t that sound perfect?” He trailed a path of kisses along her neck in an attempt to coax the tension out of her body. In contrast to the stormy atmosphere in William’s suite, all was peaceful and serene in the Club Floor lounge. It was a quiet retreat for well-heeled guests occupying the luxurious rooms and suites on the hotel’s exclusive Club floor. 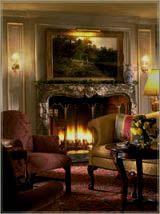 On this evening, the lights in the room had been turned down low, and a fire crackled in the ornate fireplace, creating a cozy atmosphere. The lounge had only two occupants. William sat on a gold damask sofa. He had chosen to sit there hoping that Elizabeth would share it with him, but she had selected the red overstuffed armchair across from him instead. She had removed her shoes and was curled up in the chair, her eyes closed. He sipped his coffee, a contemplative smile on his face as he watched her sleep. Oddly enough, despite his long day and his exhaustion earlier in the evening, he was alert and awake now. He felt as though he were standing guard over Elizabeth while she slept, and it pleased him on some deep, primal level. Although it was late, the city was not entirely asleep. A truck backfired in the street nearby. Elizabeth stirred and opened her eyes. She blinked and yawned, smiling self-consciously when she saw William watching her. She looked at him, eyebrows raised, and silently waited for him to continue. “We finished our dance,” she said with a ghost of a smile. “That’s not what I meant, and I think you know it,” he answered, his voice deep and caressing. For a moment their eyes locked, and William felt the now-familiar wave of desire that Elizabeth so easily provoked in him. Had she been sitting beside him, he would have reached for her, gathered her into his arms, and tasted her enticing lips at last. But the distance between them felt too large to bridge, especially after she looked away from him, staring at her hands again. He nodded reluctantly. It annoyed him that Caroline had manipulated him into talking to Charles at a time when she could “accidentally” bring Mr. Bingley out to overhear the conversation. “I’d like to see that.” William had only seen this particular phenomenon in photographs. “Driving around there confuses me, so I usually take the bus. But I guess you wouldn’t even consider leaving the Z3 at the hotel,” she teased, an impudent light in her eyes. Elizabeth and William exchanged a worried glance and both stood up. As they did, Jane walked into the lounge. “Are you ready to go, Lizzy?” Jane asked. Her voice was calm; however, Elizabeth saw the tears in her eyes. Jane paused for a long moment, facing Elizabeth, her back to Charles and William. Elizabeth saw the agony in Jane’s eyes; however, Jane composed herself before she turned back to Charles. “Of course,” Elizabeth answered, grabbing her purse. She exchanged a brief look with William and hurried after Jane, who was already out the door of the lounge. An elevator arrived, and they stepped on board. As soon as the elevator doors closed, tears began to run down Jane’s cheeks. “Lizzy, please, get me out of here,” she sobbed. “The manager didn’t leave you a complimentary bottle of scotch? What kind of dump is this?” Charles was ransacking the bar area of William’s suite, in search of a liquid remedy for his pain. “Okay, fine. Have it your way. See you later.” Charles turned toward the door. “All right, you win. I’m calling them now.” Getting drunk was only going to make Charles feel worse, but if he was determined to do it, he would be safer here in the suite than roaming around on his own. William frowned. That didn’t sound like the warm, gentle Jane he had encountered earlier in the day. Still, he had seen with his own eyes how chilly and distant she had been when she returned to the lounge. It seemed strange that a woman who had just broken an engagement with a man she supposedly loved would be so calm and unemotional, and he began to wonder about Jane’s true nature. “What did she say about the pre-nup?” he asked. William raised his eyebrows. He thought back to Mrs. Bennet’s conversation with Mrs. Phillips:“Jane’s a lucky girl.” “No, she’s a smart girl. I taught her well.” Still, if money were her primary interest, wouldn’t she have signed the pre-nup and become Mrs. Bingley, thus gaining entry into her in-laws’ lavish lifestyle? William wasn’t sure what to think. William sighed and settled back into his chair. It was going to be a long night. Elizabeth crept out of Jane’s bedroom with a sigh of relief. It had been a long, painful evening for both of them. Jane had described her conversation with Charles, at last surrendering to the agonized sobs she had managed to choke back until then. Elizabeth had managed to coax her into lying down, and despite Jane’s insistence that she would be unable to sleep, she had finally drifted off, clutching her pillow. The spare bedroom was just across the hall. Elizabeth dropped her new dress at the foot of the bed and unzipped a side pocket of her suitcase, rooting through until she found the knee-length tee shirt in which she slept. She pulled it on and tiptoed into the bathroom to brush her teeth. Once there, she inspected her reflection in the mirror. Her hair had survived the evening surprisingly well. She reached up and captured a curl, twirling it around her fingers and recalling the gentle touch of William’s hands in her hair. I wonder what would have happened if Caroline hadn’t shown up right then? She shivered, remembering the heat in William’s eyes in the lounge when he had told her that he regretted not finishing what they had started. She ran a finger along her lips, wondering what his mouth would have felt like on hers. The phone rang, and she jumped, startled. She dashed to the kitchen to answer it, hoping that the sound had not awakened Jane. “It’s Charlotte.” Her friend spoke in a rough whisper. Elizabeth hung up the phone and tiptoed down the hall to her bedroom. Fatigue overtook her quickly, and she fell asleep thinking about a pair of intense brown eyes.